Galleri Brandstrup is honored to announce “Refleksjoner” (Reflections) a solo exhibition by Håkon Bleken, in celebration of his 90th birthday. The exhibition opens January 8th 2019 and will remain open until February 9th 2019. “Refleksjoner” exhibits a new series of works from 2017-2018, which includes 25 works consisting of oil paintings, collages on canvas and self portraits. The show is also a commemoration to our 20-year collaboration with Bleken, and it will be the 10th solo exhibition presented by the artist at Galleri Brandstrup. The exhibition will open January 8, 2019 at 6pm. Håkon Bleken is and has been one of the most prominent Norwegian artists over the last forty years. He has had an immense influence on the Norwegian contemporary art scene, and is considered a national master. A series of coal sketches titled “Fragments of a Dictatorship” from 1971 is regarded as his breakthrough as an artist. After decades of prosperous recognition, marked by artistic courage, political conscience and a number of prestigious exhibits and awards, Bleken continues as an active icon within Norwegian contemporary art. It is not easy to classify Bleken’s artistic oeuvre, as he works with a range of media: painting, coal drawing, collage, stained glass, different graphic methods and book illustrations. Yet, he is best known for his paintings, which vary between carefully detailed composed pieces and intelligent simplicity in abstractionism. His main subjects are landscapes and portraits, executed in evocative color pallets and energetic brushwork. 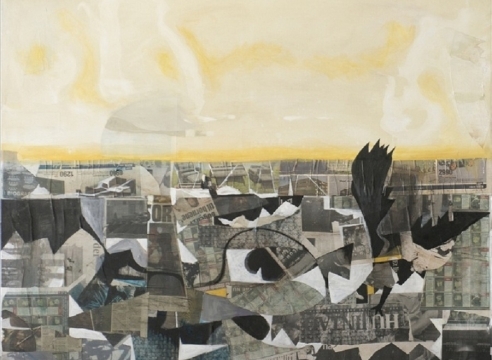 In his later work, he has been using modernist cubistic collage, and he often works in dialog with old traditions and historical cultural expressions. Human suffering and social activism are subjects that often reappear in Bleken's works and his work is always relevant. He revives a particular type of socio-political anxiety from the 1950s, and simultaneously, he chooses up-to-date topics of the current era. He applies art in a constant quest to find his place in life, which is reflected in his ability to continually reinvent himself as an artist. He attunes his works to the emotional details of his own life, and connects them to the real socio-political world around him. Since his debut in 1951 he has shown in solo exhibitions in a variety of Norway’s most important galleries and museums such as the Norwegian National Gallery, Trondheim Kunstmuseum and Henie Onstad Art Centre. Bleken’s works are included in important collections such as the Norwegian National Gallery, Astrup Fearnly Museum, Trondheim Kunsmuseum and Equinor. His art is displayed in St. Olav Catholic Church (Trondheim), Nidarosdomen, Olavshallen, Statkraft, Oslo Concert Hall, and at Oslo Central Station. In 2009 a documentary about his life was released, which premiered at Kosmorama in Trondheim in March 2009. In 2005 he won the award of Anders Jahre kulturpris and in 2009 he was awarded by the King of Norway the title of Commander of the St. Olav Orden. “Refleksjoner” will run alongside Bleken´s solo show, "Do Not Go Gentle” at Henie Onstad Art Centre, which will be open until February 24, 2019.